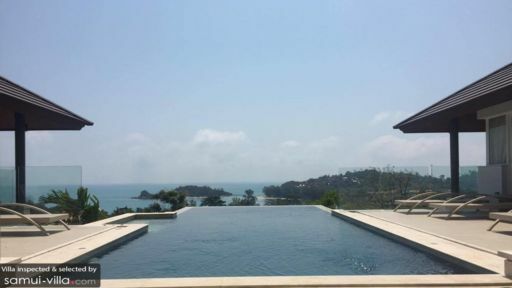 Villa Belle is part of the Horizon Estate in Koh Samui that is situated close to the pristine white sand beach of Choeng Mon. Offering guests views that span across the sea and neighbouring islands along the Gulf of Thailand, the villa is a mix between tropical living and modern interiors. From an infinity-edge swimming pool to open-plan living areas, the villa has sights that will leave you speechless. 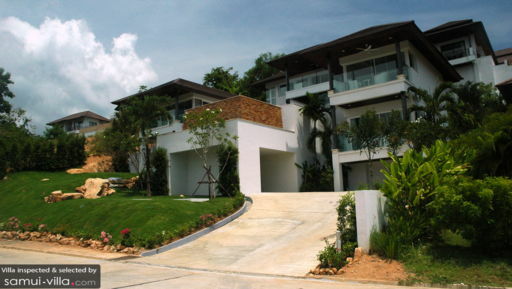 Five bedrooms occupy the three floors at Villa Belle so you can relish sea view no matter where you are. Enjoy a fun-packed and relaxing holiday with your friends and family, explore nearby Chaweng beach and Big Buddha for memorable times. The master bedroom occupies the top floor of the villa while the remaining four bedrooms are located two each of the other floors. The poolside bedrooms allow access to the pool deck through glass doors whereas each of the five bedrooms at Villa Belle gives you a vantage point from where you can gaze endlessly at the beautiful ocean. The bedrooms are designed with comfortable, wooden-frame king-sized or single beds, light furnishings, and glass doors for pleasant views. Bedrooms are accompanied by a terrace with rattan seating overlooking the ocean. There are ensuite bathrooms with each bedroom. Villa Belle is home to most lavish swimming pool with a striking infinity edge that gives you a cascading effect into the big, blue ocean in front. Unobstructed views can be enjoyed even while relaxing on the sun chairs found on the shaded pool deck. You will find tropical verdure surrounding the property to complement the variant shades of blue from the ocean and skies. The front of the pool deck is fenced with glass fencing so you can rest easy regarding the children’s safety. Glass doors from the pool deck leads to the modern living space at Villa Belle that is well-designed with minimal interiors and comforts. There is a vibrant sectional to lounge on facing a TV for all your entertainment needs. The bright tangerine brings cheerful ambiance to the space. The floor is draped with a soft-to-touch rug for added comfort. Since the living area is air-conditioned, you can even rest amidst cooler climate to escape the heat outdoors during the afternoon. There is a kitchen and dining area in the living area so you have a massive common space where you can sit, watch some TV, relax, enjoy a meal and prepare food together with everyone. The kitchen is fully-equipped with modern amenities and plenty of facilities to help you prepare anything from a sandwich to delicious spreads. Villa Belle is fully-staffed with dedicated employees who are there to take care of everything during your stay. Housekeeping, maintenance and upkeep of the villa is looked after so you have nothing to worry about. The staff can book transportation, in-house massage and even call for a private chef. These services are charged extra. Located in the heart of Samui’s thriving island life, the villa is found near Choeng Mon beach where there are plenty of restaurants for beachside dining. Chaweng beach is a short drive from the villa and so is Fisherman’s Village. Restaurants that you can try out include Secret Garden, Noori and La Fabrique French Bakery to name a few.